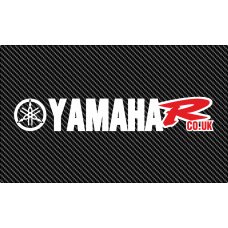 A pair (two) of YamahaR (Forum - www.yamahar.co.uk )cut vinyl stickers in your choice of colour. This decal is offered with two colour options online for simplicity, although we can produce other options on request. Size is 125mm wide by 26mm tall. PLEASE NOTE : This is a cut vinyl decal, backgrounds displayed are for illustration ONLY! The red elements are layered onto the main colour not printed.